Workday travelers check their Twitter feeds during morning commutes. Students send Snap Chats from lecture halls, coffee houses and movie theaters. IPads and tablets light up bookstores and airport terminals. In many places in the modern world, it’s here a screen, there a screen, everywhere a blue light-emitting screen. According to the American Optometric Association, all of that glow is cause for concern when it comes to vision. Enough concern, in fact, that the organization has designated March as “Save Your Vision” month and committed all 31 days to promoting awareness about the hazards that can result from too much digitally emitted light – from headaches and blurred vision to dry eyes and sleep disruption. The alleviation of some of those symptoms is where University of Missouri–St. Louis Associate Professor Carl Bassi’s latest research comes into play. 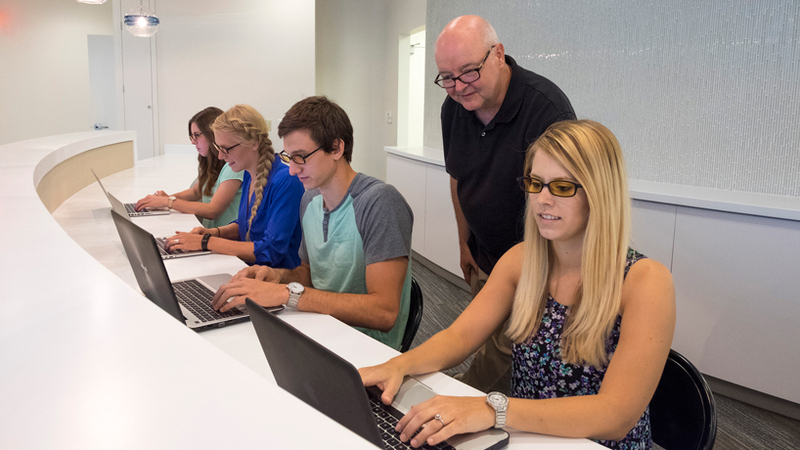 Last summer, Bassi and UMSL optometry student Blair Gerratt joined forces with Washington University-based researchers Rajendra Apte and Jonathan Lin to investigate the effects of a special type of lens produced by Japanese eyeware company JINS Optical. The JINS lenses were specially designed to block a high amount of that short wavelength – also known as blue – light that modern digital screens emit. The researchers hypothesized that wearing the lenses would result in less eye fatigue and, therefore, less associated eye discomfort. Second-year optometry student Blair Gerratt had the opportunity to assist with Associate Professor Carl Bassi’s study thanks in part to the Optometry Scholars program, an initiative that provides funding and other assistance for UMSL students interested in gaining more research experience. To test their hypothesis, Bassi and the rest of the team recruited a sample of 36 healthy individuals and randomly assigned them to three groups – those who would wear the high-blocking lenses, those who would wear a lesser protective low-blocking version and those who would wear lenses with no blue light-blocking technology whatsoever. Each group of participants donned their assigned spectacles while performing computer tasks on identical laptops in a controlled environment for a period of two hours. To measure eye fatigue and its associated symptoms, the researchers calculated participants’ critical flicker fusion frequency and also administered questionnaires related to the perception of eye comfort before and after the completion of the computer tasks. The results of the study, published in the January issue of “Investigative Ophthalmology and Visual Science,” indicate that the researchers’ hypothesis was correct – the high-blocking lenses may indeed limit the discomfort that can result from overexposure to digital light. The findings are significant because, while similar work has been conducted elsewhere, the UMSL study was the first of its kind to focus specifically on a North American population. Furthermore, the results lay the groundwork for more extensive research that could ultimately lead to more protective measures or perhaps inform the creation of future devices. The study was also noteworthy in one other way. 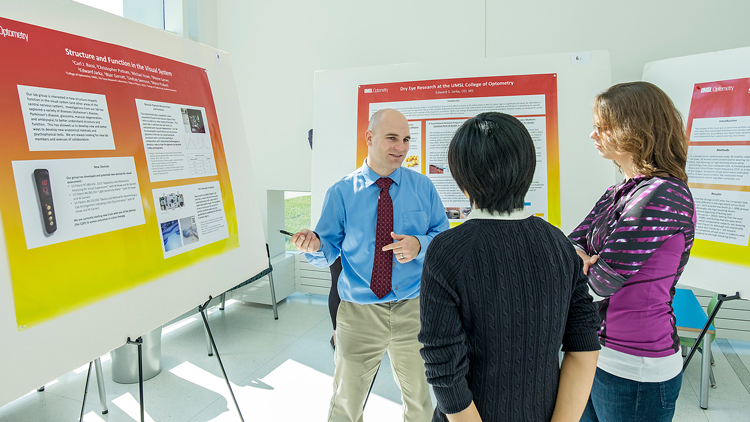 Such a research opportunity – and the many others like it that happen at UMSL – are invaluable experiences for the students who get to participate. In this case, that student was Gerratt, who is now in the second year of the Doctor of Optometry program at UMSL. The university’s Optometry Scholars initiative helped fund his participation in the study. For his part, Gerratt says the opportunity made him want to continue to delve into further research.